Though Poles have played an important role in world history for more than one thousand years, reference books devoted to the accomplishments of these men and women have been virtually nonexistent. The Polish Biographical Dictionary fills that void. The product of more than ten years of research by author Stanley Sokol, volume profiles nearly nine hundred Poles from the tenth century to the present, offering insightful and informative commentaries on the individuals who have helped shape the history of Poland and the world. 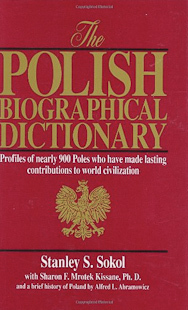 The book features entries on Poland’s most famous citizens, including Nicholas Copernicus, Frederick Chopin, Marie Curie, Waclaw Nijinski, Pope John Paul II, and Lech Walesa. It also profiles ten saints and eleven Nobel Prize winners, as well as lesser known individuals, including the first woman to sail solo around the world, the man behind the lunar rover, and the inventor of the automobile windshield wiper.